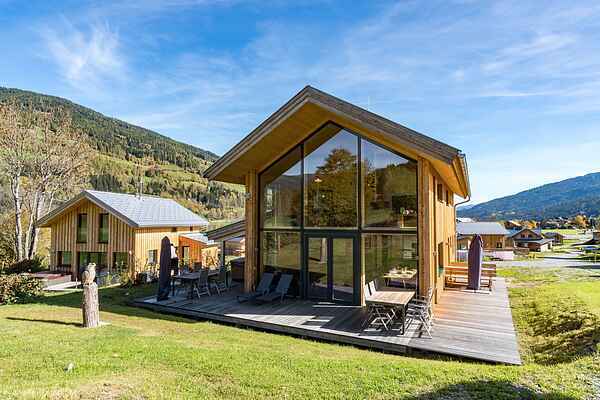 This is a detached, luxurious wooden panorama chalet at the foot of the ski lift and ski slope of the fantastic Kreischberg ski resort. The historic town of Murau and the Kreischberg golf course are approximately 5 minutes away. The central location makes this a perfect holiday area, both in winter and in summer. More than 200 sunny days per year and a skiing area with snow guaranteed make this a perfect holiday destination for all seasons. This spectacularly designed detached wooden chalet is fully equipped. The living area is situated on the ground floor. Here, you'll find a lovely living room with open-plan kitchen, spacious lounge, dining area and even a cosy gas fire for pleasant winter evenings. There is also a lovely mezzanine with a gorgeous view through the large, stunning, glass wall. The spacious chalet boasts 5 bedrooms and 4 bathrooms as well as a wonderful hot tub, a shower, an infra-red sauna, and more. The living room opens directly onto the outdoor terrace and into the garden. There is a fantastic jacuzzi on this terrace. The chalet and the terrace both offer views across the skiing slopes, the ski lift and the surrounding mountains. The cross-country skiing trail is immediately behind the chalet. As the area surrounding the chalet is still under development, this could cause some inconvenience.